Curiosity can sometimes take years to be satisfied. Cockney Rebel were, along with Sparks, the first band I was a fan of, as Make Me Smile (Come Up and See Me) became one of the more unexpected number ones of its time, still some years away from its fate as a staple of the unimaginative pub DJ’s record box, along with 500 Miles, Sweet Caroline, Delilah, Daydream Believer and the monarch of them all, Brown Eyed Girl. Around this time, its parent album, The Best Years Of Our Lives, arrived in our house. Alongside the star of the show, it ranged from the goofy to the melancholy to, on Back To The Farm, the genuinely unsettling. Aged six, I understood little of this but liked it a lot. Another arrival was, in hindsight, truly life-changing for me. The NME Book of Rock was not so much a window as an elaborately constructed archway to a world I was far too young for but fascinated by nevertheless. Although baffled by the omission of Mud, I was intrigued by names that would make more sense, and have sounds put to them, later – Pentangle, Third Ear Band, the United States of America and scores of others. But Cockney Rebel’s entry really confused me. Why were they saying their new album was called The Way We Used To Be when it was called The Best Years Of Our Lives? 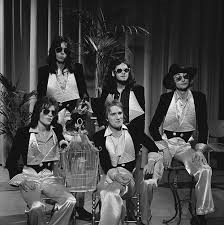 Even worse, the people playing with Steve Harley on that album had solid, sensible names – George Ford, Duncan Mackay – but this book was telling me the group was full of funny names like Jean-Paul Crocker and Milton Reame-James. Why was I being lied to? Later, amid punk and post-punk, Cockney Rebel were pushed to the back of my mind, a spell punctuated briefly by a splenetic rant from Harley during an NME (them again) interview with Danny Baker about Joy Division, after he had chanced to see their legendary performance on the BBC’s Something Else. It showed him to be grievously out of touch but, for me at least, his time would come again. In a fit of youthful nostalgia, at 14 I found myself revisiting The Best Years… and its follow-up, Timeless Flight. This included the grandiose but gripping single Black Or White, which might have eclipsed Make Me Smile had it not been issued two weeks after Bohemian Rhapsody; clearly, there was room for only one overblown orchestral six-minute single released on EMI and the superior one lost out. It also had Understand, an aimless seven-minute groan which taught me the true meaning of boredom – but some months later, Bishopbriggs Library added a casette of Psychomodo to its riches and it’s a record where boredom is as remote as minimalism or restraint. The aforementioned NME book averred that Cockney Rebel took numerous vogueish styles and moulded them into “one seemingly original mode” and sure enough, it’s hard to pin them down, which is where Psychomodo’s splendour lies. It’s not quite glam, though there’s a flirtation on the R & P (rhythm and pop – a genre is born) of the title track and the sarcastic charivari of their second top 10 hit, Mr Soft. Nor is it prog – they came nerve-janglingly close on Sebastian and Death Trip on their debut album, The Human Menagerie, but Harley was far too close at this stage to the Bowie/Roxy end of the spectrum to be devoured by mellotrons; as such, the symphonic tendencies of Cavaliers are moderated by intemperate language and waterfront harmonica, while the delicately orchestrated Bed In The Corner is more Forever Changes than Topographic Oceans. And it’s definitely not metal, though Sling It!’s commotion puts you right in the midst of the shipwreck it describes. Dylan and Mott were other frequently suggested touchstones but Psychomodo is encapsulated by its uncategorisable side-closers. Tumbling Down is wistful, moist-eyed and slightly daft as Harley mourns “Oh dear, look what they’ve done to the blues” in a song which owes precisely nothing to Chicago or the Mississippi Delta but a good deal more to Mozart’s Vienna. It’s fitting that it was chosen as a climactic song for Venus In Furs, the band in the film Velvet Goldmine, whose set list is cannibalised from the songs of Cockney Rebel and their contemporaries. At the end of side one came Ritz, a real lost classic, unlike the lost classics which are lost for an excellent reason. The simple, cyclical acoustic pattern suggests Astral Weeks but never apes Van Morrison directly, with strings hovering like the vultures mentioned in Tumbling Down and brass which strolls coquettishly one minute and has a contract out on Jericho’s walls the next. Above it, Harley’s distorted voice, too mannered for many, shows dexterity with some of his most erudite lyrics (“Couch my disease in chintz-covered kisses/Glazed calico cloth my costume this is”). In one of those irresistible coincidences, this and Psychomodo both namecheck Desdemona – and I was doing Othello at school at the same time I discovered the album. Three-fifths of the band quit soon after – those funny names and bassist Paul Jeffreys, who would be killed at Lockerbie, prompting Harley, touchingly, to dedicate Sebastian to him on tour the following year. The sensibly named, highly proficient new Cockney Rebel made more fine music and provided Harley with his pension (as he calls Make Me Smile) but would never be as effervescent or kaliedoscopic as on those first two albums or the lovable stand-alone hit Judy Teen. Those were magic – the best years of their lives (PG).